Manufacturer & Trader of Clean Dish Racks. Our product range also comprises of Barbeque Grill, Refrigeration Equipment and Cooking Equipment. Owing to the expertise of our team of experienced professionals, we are able to introduce an exclusive range of Clean Dish Racks. 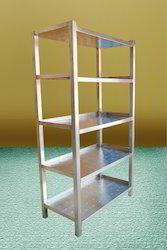 At our unit, our professionals manufacture the racks by adhering to industry norms. They also make sure to use quality stainless steel materials and approved components for manufacturing the racks. Once the racks are ready for operation, our engineers ensure by opting strict quality checks so that the racks offers reliability and high performance to the clients. Furthermore, clients can opt for custom design and compact design according to business requirements. Looking for Clean Dish Racks ?